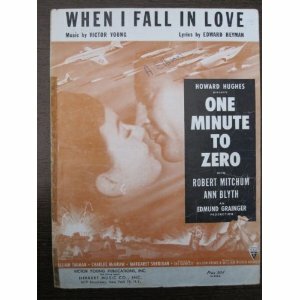 “When I Fall in Love” was written for the 1952 romantic war film One Minute to Zero, starring Robert Mitchum and Ann Blyth. The tag line on the movie poster was “Back of every man of action …. there’s a woman made for love.” Well, it was 1952. When I Fall In Love was recorded on December 30, 1958 and released in 1959 on the album In Person! It was arranged by Ralph Sharon.